Lincoln, New Hampshire, is a small town in the state’s White Mountains area. Visitors come here mainly to enjoy the beautiful natural landscapes surrounding the town. It is popular all year round, with gorgeous fall foliage and world-class skiing topping the lists of reasons to go, but the town is nonetheless enjoyable in spring and summer. There are numerous family-friendly theme parks in the area and a number of outfitters that offer tours on snowmobiles, kayaks, canoes, and in buses. Franconia Notch State Park, the Flume Gorge, and the surrounding White Mountain National Forest offer ample opportunities to get out into nature, whether with one of the aforementioned tours or on your own. The Flume Gorge is an 800-foot natural gorge that was discovered by a local elderly lady in 1808. Since that time, it has become a popular place for visitors and locals alike to get out into nature and enjoy the beautiful scenery. 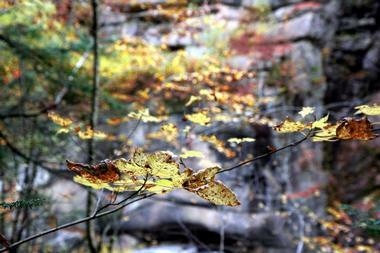 Those who wish to visit the Flume Gorge can hike in from the Flume Visitor’s Center. From there, you can either hike just the distance of the gorge or can traverse a scenic 2-mile loop through the area. The walk is moderately difficult with a large number of stairs and a great deal of uphill walking. Clark’s Trading Post is a popular family-friendly theme attraction in the White Mountains. The park has a number of rides and shows, including a famous black bear show, Chinese acrobats, water blaster boats, climbing towers, and an exciting water raft ride called the Anaconda Escape. There are five museums, including a museum of old time Americana as well as four shops stocked with a wide variety of souvenir gifts. 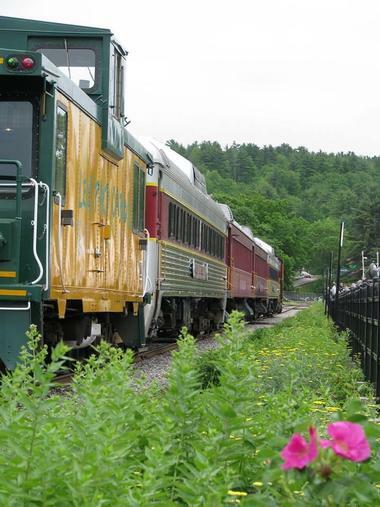 One of the most popular attractions is the White Mountain Central Railroad, which operates seasonally, several times a day. The train ride takes about 25 minutes and travels through a covered bridge from 1904 that spans the beautiful Pemigewasset River. White Mountain National Forest is a US Forest Service managed forest on the border of Maine and New Hampshire in the White Mountains. The forest is a year-round destination with plenty of summer adventure and areas to explore, such as clear mountain lakes, winding streams, ample wildlife watching opportunities, and more. In the fall, the park turns vibrant shades of reds, oranges, and yellows and is a popular place to view foliage. The wintertime brings snow and skiing to the mountains as well as road closures. The park has a cog railway that carries visitors up a mountain peak to enjoy the scenery, both on the way up and from the top. Whale’s Tale Water Park is a family-friendly waterpark that spans 17 acres. The park has been open for 25 years and has won awards as being one of the best waterparks in the country. There are 11 different attractions in the park, including the newest, Akua Beach and Poseidon’s Village. Those looking for the thrill of a water slide will find six different exciting options in the park with something for all ages. There’s also a large wave pool and a lazy river that everyone enjoys. There are several rides and attractions that cater to both kids and adults, including Whale Harbor, a play area for young kids and toddlers with several fountains and water slides. 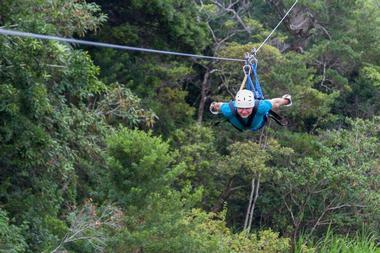 Alpine Adventures is a massive mountain park that offers a variety of exciting attractions such as off-road safari tours, snowmobiling, snowshoeing, a high ropes course, ziplining, and treetop canopy tours. The park is very family friendly and many of the attractions are great for older kids and teenagers, especially the tree top canopy tour, which is perfect for first-time zipliners and families. 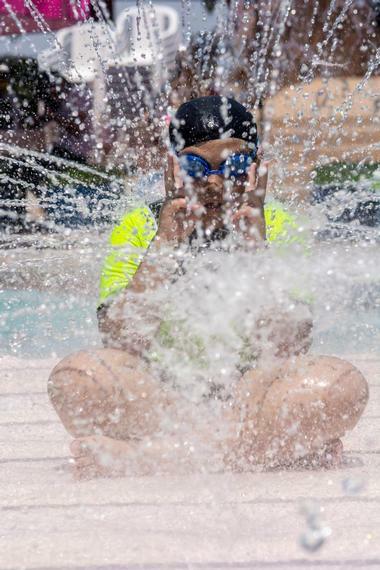 They’ve also recently opened a water adventure component to the park, including a water play area with ziplines known as Candia Springs Adventure Park and a more traditional waterpark called Whale’s Tale Water Park. Art’s Outdoor Outfitters is an outfitters company offering canoe and kayak rentals. 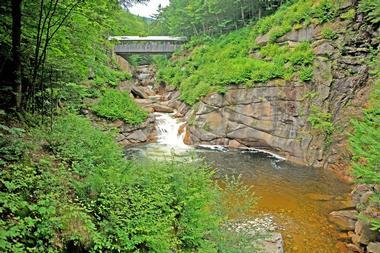 Each day they offer four different trips along a section of the Pemigewasset River. Paddling the river is a great way to experience a relaxing time in unspoiled nature, but there are also plenty of opportunities for adventure. The river has a number of swimming holes where you can take a break along the way. In addition to paddling, they also offer daily bike and standup paddleboard rentals. If you are hoping to canoe or kayak in the White Mountains, Art’s Outdoor Outfitters is one of the best options near Lincoln. Attitash Mountain Resort is a ski area in Bartlett. The ski area was built in 1938 and, as such, has been a popular destination for powder-lovers for decades. 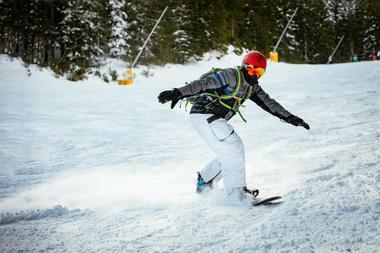 The resort offers ample opportunities for skiing, snowboarding, and other winter activities. There are 68 ski trails accessed by 11 lifts on two interconnected mountains. 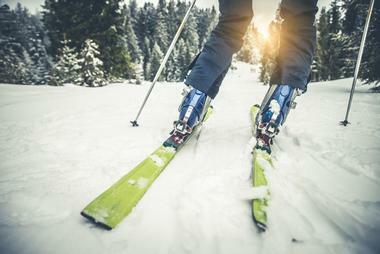 You’ll find something for all ability levels of skiers, from beginners to advanced. For those who wish to stay the night, the resort has condo-style accommodations available year round with several room types and numerous amenities. 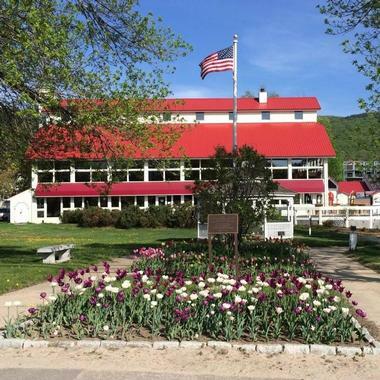 The resort is open all year round and offers adventurous summer activities and beautiful fall foliage for those who come other times than in the ski season. Cannon Mountain is a ski area located inside Franconia Notch State Park. There are eleven total ski lifts that access 97 trails and glades on the mountain. The park’s 285 skiable acres offer skiing of every difficulty level, so there’s something for beginners all the way up to very experienced skiers. There’s also an onsite ski and snowboard school for those who wish to learn, so don’t let your inexperience keep you away! Cannon Mountain was also home to the first passenger tramway in the United States. It was built in 1938 and the original tramway operated until it was replaced by the current tram in 1980. This park’s namesake, Franconia Notch, is a breathtaking mountain pass that you can travel through on 8 miles of I-93 from Echo Lake to the Flume Gorge. The road is quite curvy but offers stunning views as it passes between the mountains of the Franconia and Kinsmen mountain ranges. In literature, Franconia Notch was the famous home of the Old Man of the Mountain. Other interesting attractions exist quite near the park, such as the Flume Gorge, Cannon Mountain, and Echo Lake, making this area a treasure trove for adventure and nature lovers. 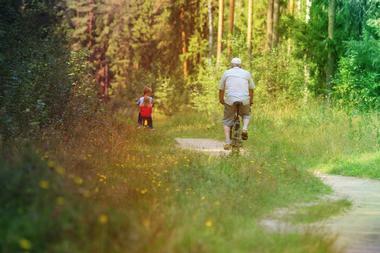 Camping is a popular activity in the park, as is swimming, paddling, fishing, cross-country skiing, and hiking. Gordi’s Fish and Steak House is a laidback family-owned restaurant and bar that serves a delightful menu of seafood, beef, chicken, and pasta dishes as well as burgers and sandwiches. 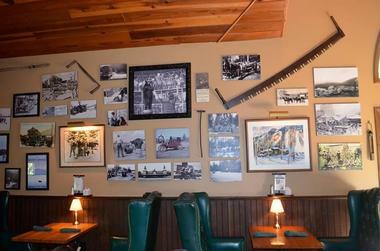 The rustic interior is decked out in ski memorabilia, playing homage to the fact that two of the owners were previously Olympic skiers. The restaurant also has outdoor dining for those who are looking for a pleasant al fresco meal. 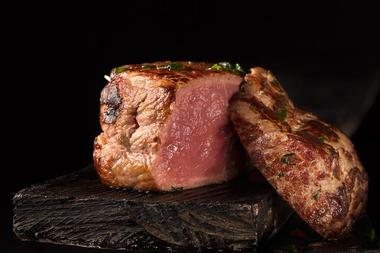 Menu specials include the Gordi’s Bleu Cheese Filet Mignon, the prime rib and the Belgian-style mussels. On Thursdays they offer an all you can eat fish and chips special, which is popular among both locals and visitors. 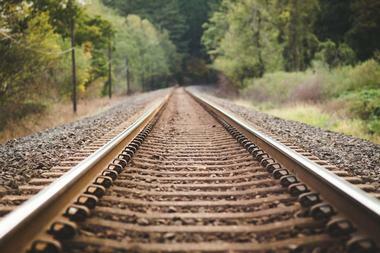 The Hobo Railroad is the collective name of two heritage railroads in the central part of New Hampshire. The Lincoln branch of the railroad offers scenic passenger excursion rides through the White Mountains. The views are stunning and include vistas of the area’s rivers, lakes, and mountains. The railroad is open seasonally from Memorial Day weekend to late October for normal train rides and late November through the middle of December for their Santa Express trains. The fall is one of the most popular times, with the railroad offering fall foliage train rides up to eight times a day in autumn. 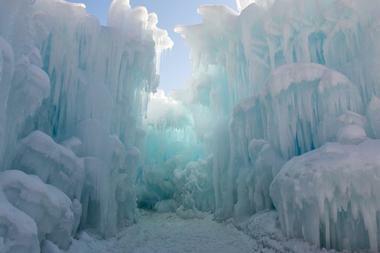 Ice Castles is a popular seasonal tourist attraction located at the Hobo Railroad. Each year during winter, tens of thousands of visitors come to Lincoln to experience the castles, which weigh up to 25 million pounds and feature frozen slides, thrones, tunnels, archways, and lights. The experience is accompanied by music, making for a magical experience as you walk through the massive ice structures as they are changing colors. They make a completely new design each season, attracting people back year after year for a different experience. They sometimes also have special events and performances, such as ice princess photo ops and fire shows. Loon Mountain is part of the White Mountain National Forest. The mountain stands just over 3,000 feet tall and is best known as the home to Loon Mountain Ski Resort. The mountain is comprised of two summits, North and South Peak, as well as a spur off North Peak known as Loon Peak. The ski resort is one of the state’s most impressive, with 61 ski trails, award-winning terrain parks, and tree skiing areas. While the ski resort is quite popular and draws many winter tourists, the mountain is a year-round recreational area with scenic gondola rides, an aerial forest adventure park, mountain biking, and other fun activities in summer and fall. Moose Brook State Park is a recreational area located in Gorham that is open seasonally from May to October. The park is popular for camping, hiking, picnicking, and mountain biking. 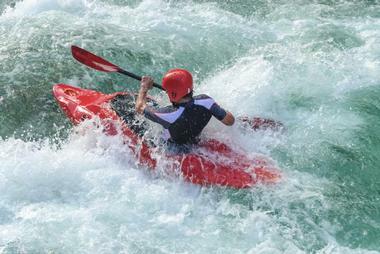 There are also water activities, such as fishing and swimming in the Moose and Peabody Rivers. The park gets its name for Moose Brook, which fills the swimming area with chilly water from the mountains and then flows into the nearby Androscoggin River. 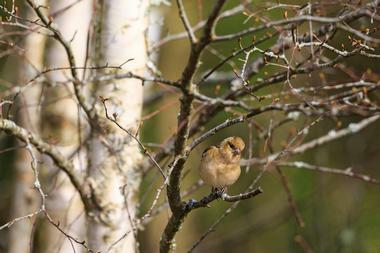 For those wishing to camp, the park has 59 campsites throughout with both shaded and open, sunny campsites available. The park is often used as a base for those exploring the White Mountains a bit more deeply. 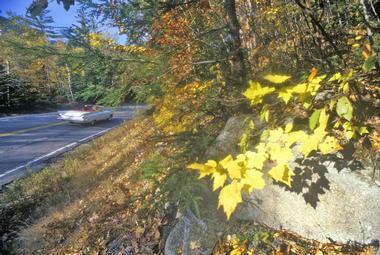 New Hampshire Route 112 traverses nearly 60 miles from east to west across the northern part of New Hampshire. The eastern section of the highway travels through the White Mountains and is known as the Kancamagus Highway, with most of that section designated a National Scenic Byway. The drive is beautiful year round but is most popular during September and October, when tourists flock to the area to view the autumn foliage. The highway is open year round but may see some temporary closures in the winter while crews clear snow from the road. On the western side, the highway passes through Kinsman Notch near the Lost River tourist attraction and is called Lost River Road. One Love Brewery is a German lager house and gastropub located inside the historic Henry Paper Mill. The space has been renovated with many beautiful touches, such as the reclaimed wood on the bar and tabletops. They also used many eco-friendly and recycled materials during the renovation. The brewery is a family-owned and operated establishment that serves delicious food and house-brewed lagers. The menu features a number of snacks that go well with their brews, such as cheese curds, fried avocados, and their delicious firecracker nachos. They serve an always-rotating beer selection that will keep you coming back over and over again to try them all. Out Back Kayak is a canoe and kayak outfitter that offers a wide range of outdoor activities and adventures regardless of the season. 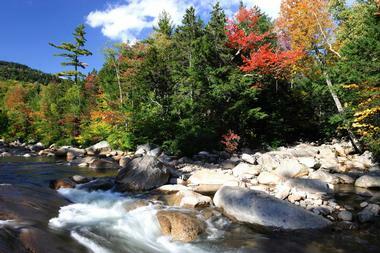 They offer 1 and 2-hour guided tours on 80 acres of beautiful land bordering the Pemigewasset River. The ATV park contains a private pond, a sand dune, and plenty of mud after a good rain. They offer several options for guided kayak tours, with the two most popular being about 7 miles long and taking approximately 2 hours to paddle. You can also rent kayaks to paddle by yourself on Mirror Lake. 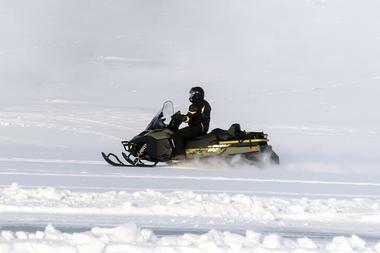 In the wintertime, Out Back Kayak offers snowmobile tours and snowshoe rentals. 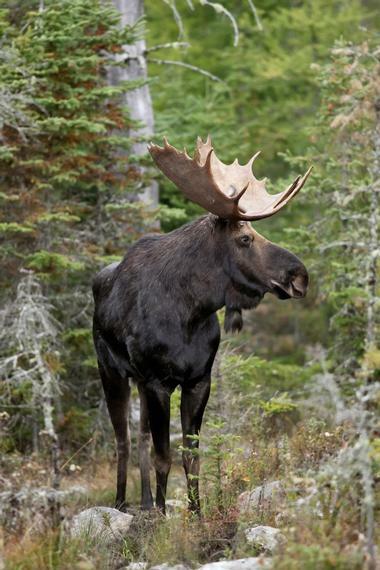 Pemi Valley Moose Tours is a tour company that offers educational bus tours through the forest and historical sights and, of course, includes up-close views of moose in the wild. The tours are completely family friendly. Tours are completed on buses and include a step-on tour guide who will be able to look for moose without distraction as the driver navigates the roads. On some tours, the group is able to get off the bus and see moose up close. Make sure you pack your camera to document your encounters with these amazing animals in their natural habitat. 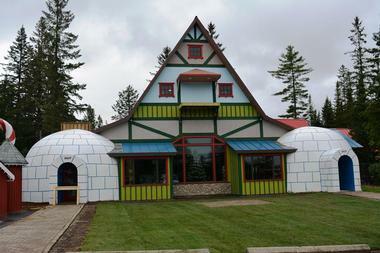 Santa’s Village is an amusement park in Jefferson that is themed around Christmas. Most of the park’s 23 different rides have a winter or Christmas-themed name or design. The park is designed as an attraction for the whole family, with plenty of rides that bigs and littles alike can enjoy. Santa and his reindeer also make appearances for photo ops. The park grounds are carefully manicured and well-kept, so strolling through the park is enjoyable. The park welcomes visitors to bring in their own food, but their Burger Meister Food Court also has plenty of choices for tasty dining. Even though the name makes this sound like it would be a winter-only attraction, the park is actually open in summer as well. Seven Birches Winery is a winery located within the RiverWalk Resort at Loon Mountain. The winery produces hand-crafted wines created from classical European varieties of grapes as well as other fruits that are sourced locally. The winery has a production facility and tasting room that are both open daily. When you arrive at the tasting room, you can sample five of the wines from their current tasting menu along with a set of tasting notes to guide your journey. If you’d like to learn more about how the wines are made, you can book one of their Meet the Winemakers tours to get a tour of the winery and be able to learn about the process directly from a winemaker. SledVentures Snowmobile Rentals and Tours is a snowmobile rental company offering guided and private tours, full and half-day snowmobile rentals, and more. The tours are perfect for all ability levels, so whether you are a beginner or an expert snowmobiler, there’s something available for you. They provide you with high-quality snowmobiles and all of the gear you need to stay warm on your ride. 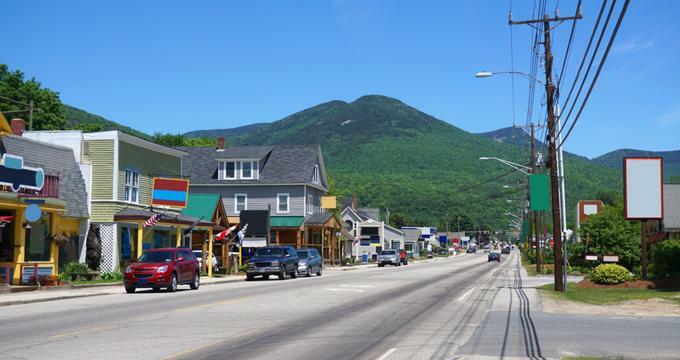 They offer a range of tours, including the Big Pond/Franconia Notch tour, the Over the Top Tour, and the Mega Midweek Mountain Adventure Tour. 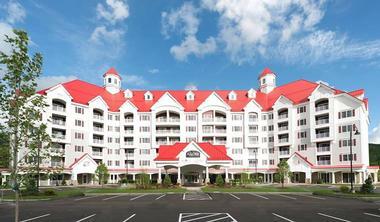 In addition to their tour options, they also offer special Sled&Stay packages with area hotels and resorts. 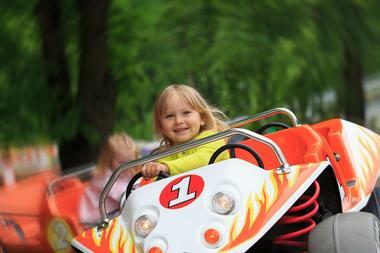 Story Land is a family-friendly theme park in Glen, New Hampshire. The park was opened in 1954 with just one ride, a fire truck, but has since expanded to cover approximately 35 acres and now has more than 20 rides. There is a narrow-gauge miniature railroad that shuttles park visitors around the park. The park has shows, dining, and plenty of characters as well as plenty of rides and play areas to keep the whole family entertained all day long. There’s something for all ages, with many rides allowing young children or toddlers, especially with adult accompaniment. Enjoy the beautiful surroundings, whimsical storybook characters, and thrilling rides as you visit one of the most popular family attractions in the area. The Common Man is a family of restaurants that serve a wide range of different cuisines and dishes. You’ll find almost anything you could ask for on the menu, with Italian, classic American, New England, and old-fashioned comfort food all making the list. They have a team of talented chefs and the entire staff prides themselves in service. The Lincoln location is a favorite stop among both tourists and locals. Some of the menu favorites include prime rib, crab cakes, and homestyle baked mac and cheese. The space is warm and cozy with a fireplace, parlor games, and comfy couches throughout.